Burlesque Queen Dita Von Teese is largely responsible for the long-overdue revival of the burlesque scene and it's only gone from strength to strength since her footprint was left on it. 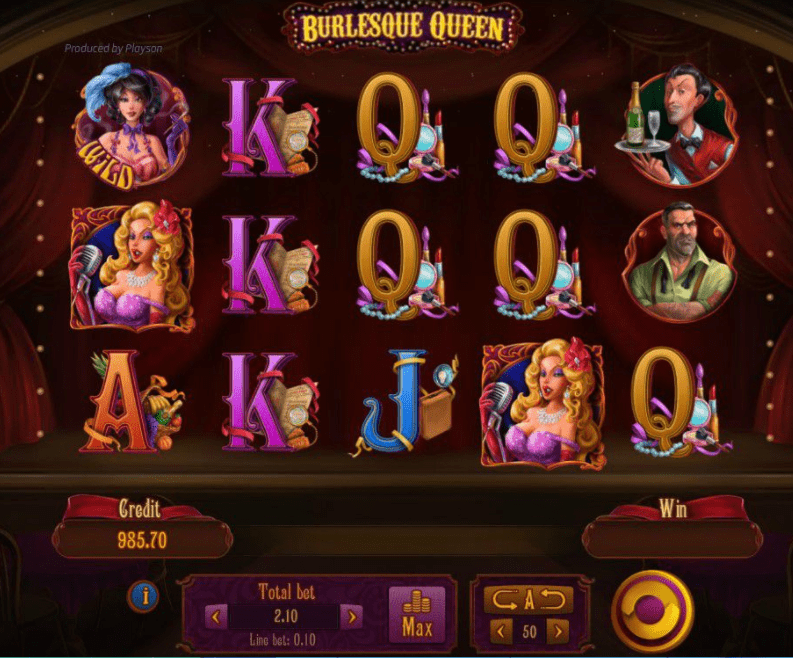 In respect of that, game developers Playson have created a 21 payline slots filled with extremely detailed and contemporary looking character symbols of burlesque queens, barman, and golden letters. Deposit today and try these online slots to spin your way across the stage. Based in the sunny island of Malta, Playson is a game developer company that prides itself on the types of experiences you’d come to expect from a deeply passionate group of individuals. With over 250 employees at the ready, it’s clear that they mean business as not only a thriving business but a one that caters to the lowest common denominator: you the customer to experience high level of fun from our slot online games. Now we know what you're thinking, this is a dirty game. Well, you're absolutely right. 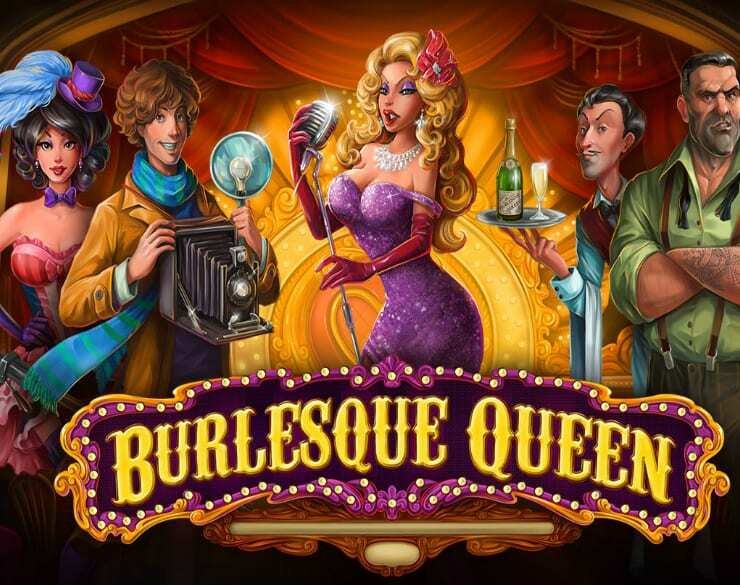 Unlike other games, it has the word burlesque in the title for a reason but not in the reasons you have in mind. Get your head out of the gutter there's money to be won and plenty of opportunities in Playson’s 5 reel, 3 line online slot Burlesque Queen. Expect rose-tinged lipstick, curly hair and sequinned dresses that are sure to make you fall in love with not only this game but the lady who serves as the centrepiece for the games logo. Check out a list of top games to choose to play best slots there is today! The 40s and 50s were notorious for this kind of entertainment, that's not to say that it can't hold a certain significance nowadays as there’s probably a few of these places still around. You’ve heard of Moulin Rouge, right? Well, this game is 3 times as entertaining as that what with its 5 reel by 21 pay-line format. The way Playson have executed such an exquisite theme just goes to show you what kind of business they are: offering high-quality forms of entertainment for your gaming pleasure. Burlesque Queen takes place on a stage where you sit almost like an audience member while you play the reels. The graphics utilise a dim sort of lighting to give you a feel for the times of old but not too dark in that you aren't aware of your surroundings. The music of this game is true to not only the era but the game itself. So expect a saucy number from this one. This game features the typical wild and the scatter, with additional features including a ‘gamble mode’. This mode can be created with every winning combination you can land. Doing so will give you a chance to double your earnings. Not for you? You can leave this mode by hitting the back button. The way to unlock this mode specifically is by landing 3 or more of the windmill symbol (the scatter) which will take you to a different screen, where you'll be sat at a dressing table selecting different items in order to reap new rewards and multipliers! It’s here where you’ll get a chance at up to 24 free spins! Only encouraging more playtime and fewer excuses not to play. If you enjoyed Burlesque Queen you might also enjoy Guns N Roses video slots game.